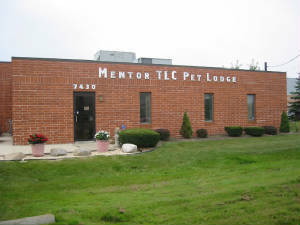 We refer all boarding requests to Mentor TLC Pet Lodge which is right around the corner from us (click here to see a map). They are the experts when it comes to boarding and grooming and is the only professional boarding kennel in this part of Ohio that is accredited by the Pet Care Services Associoation. Only a handful of professional boarding facilities in this country have earned this distinction. This accreditation is very difficult to achieve and maintain. It demonstrates their committment to excellence in facility, staffing, animal care and comfort while you are away from home. We have all boarded our dogs there for years and are very familiar with the way they operate so it's without hesitation that we refer all boarding requests to them. They are also members of the International Society of Canine Cosmetologists and have won several awards for their grooming expertise.